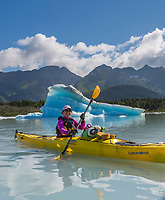 For both residents and visitors to Alaska, it is the outdoors that often holds a strong lure. And through hiking, climbing, canoeing, backpacking, skiing, rafting, kayaking, and fishing -- to name a few, are ways that people interact with this great state. Below are images of people having fun the great outdoors of the last frontier. next » | 245 sample images from this category. Try a keyword search to see them all. Paraglider takes flight in Hatcher Pass, southcentral, Alaska. Climbers on Exit Glacier, Kenai Fjords National Park, Alaska. Sea kayakers, Harriman Fjord, Prince William Sound, Alaska. Bicyclists on the Denali Park Road, Denali National Park, Alaska. Kayakers in front of Barry Glacier, Prince William Sound, Alaska. Kayaking in the calm waters of Prince William Sound, Alaska. Mountaineer mark howell belays climber in the Alaska Range mountains.